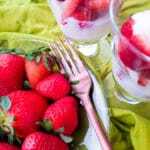 Fresas con Crema (Strawberries and Cream) | Mexican Appetizers and More! Fresas con Crema (Strawberries and Cream) is a quick hyper delicious snack or dessert for any day. Made with 4 ingredients and in less than 10 minutes. Exquisite and elegant dessert! 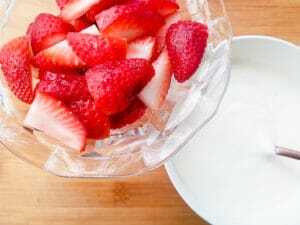 “Fresas con Crema” (Strawberries with Cream) is one of the easiest Mexican desserts to make but don’t let that fool you because….Fresas con Crema is by far one of the most delicious desserts you will ever make. This is not your ordinary strawberries and cream, that I promise you! In less than ten minutes you will have a heavenly, sweet, hyper-delicious dessert or snack. With just four ingredients to make this amazing and elegant dessert it makes it a winner for any day. And with Valentine’s Day around the corner, not sure what to make? This treat is definitely a winner! 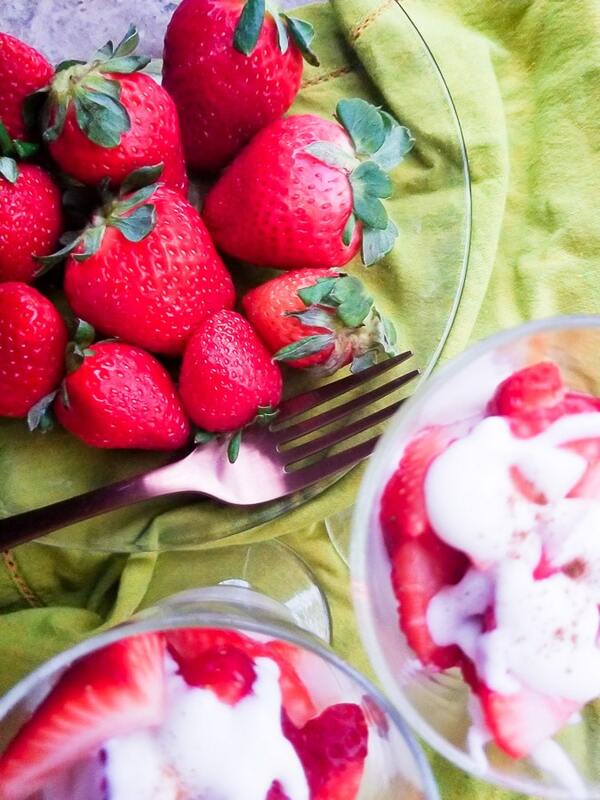 Fresas con crema will surely be a delectable surprise for anyone you may want to impress. It’s just truly amazing that just 4 simple ingredients can create such impressive flavors. This strawberries and cream makes for a no fuss delicious exquisite treat! Garnish with mint to make even more adorable and pretty! Wash strawberries and pat dry with a paper towel. Remove stem with a knife and cut strawberries in half or into bite size pieces. Combine Mexican cream (crema) with condensed milk and vanilla. Mix well. In small bowls or cups divide some of the cream and top with the strawberries, top with more cream. Set in refrigerator to cool for five minutes. Serve! *Sprinkle with cinnamon if you like. 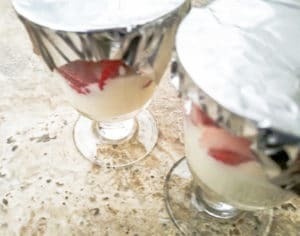 If you would like to make the fresas con crema ahead of time simply add some of the cream to each bowl or cup then top with strawberries and cover with saran wrap or aluminum foil. Refrigerate. When ready to serve, top with additional cream and serve. Combine condense milk, crema and vanilla in a bowl and mix well. Add some of the crema to four small bowls or cups, top with strawberries and additional cream on top. Garnish with mint and sprinkle cinnamon if you would like. This is a great recipe. It was simple to prepare and so delicious. I’ll be making this again soon, thank you! this looks like the perfect easy quick dessert! loving the strawberry with the condensed milk – great flavors! Its amazing that this is so good Danielle-such simple ingredients that creates such a yummy dessert! Just soo good!! This looks so fresh and springy I want to jump right in. I love thinking about the fresh berries that will be available soon. Adding cinnamon sounds like the perfect topper! so easy and so delicious! I want to put this on top of my oatmeal tomorrow. Oh you just gave me a great idea!! Thanks! Awesome! You will love this treat so much Valentina! This looks so deliciously sweet! Perfect for spring and all the fresh strawberries in the market right now! Yes its perfectly sweet! This combination of strawberries and cream is beyond perfect and delicious! The cream is like no other! Looks so refreshing, delicious and perfect for brunch! It is! Perfect for Mothers Day too! I am all about strawberries right now and this one looks so delicious and pretty at the same time! I love that it sounds so easy to put together too.